When the Soviet Union's communist empire collapsed in 1989, a mood of euphoria took hold in the West and in Eastern Europe. The West had won the ultimate victory--it had driven a silver stake through the heart of communism. Its next planned step was to help the nations of Eastern Europe to reconstruct themselves as democratic, free-market states, and full partners in the First World Order. But that, as Janine Wedel reveals in this gripping volume, was before Western governments set their poorly conceived programs in motion. 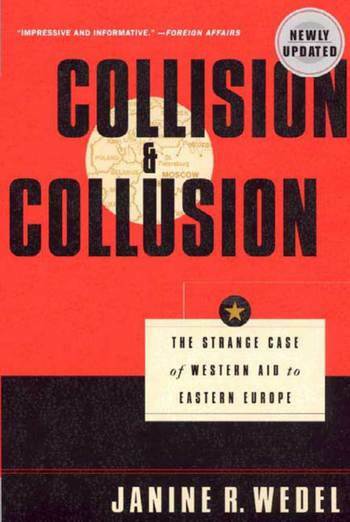 Collision and Collusion tells the bizarre and sometimes scandalous story of Western governments' attempts to aid the former Soviet block. He shows how by mid-decade, Western aid policies had often backfired, effectively discouraging market reforms and exasperating electorates who, remarkably, had voted back in the previously despised communists. Collision and Collusion is the first book to explain where the Western dollars intended to aid Eastern Europe went, and why they did so little to help. Taking a hard look at the bureaucrats, politicians, and consultants who worked to set up Western economic and political systems in Eastern Europe, the book details the extraordinary costs of institutional ignorance, cultural misunderstanding, and unrealistic expectations. Janine R. Wedel is an associate research professor and a research fellow at the Institute for European, Russian, and Eurasian Affairs at George Washington University.